The USA knows a thriving economy regarding police booking reports. On the one hand, several companies (not linked to any governmental organization) provide full access to police reports for as low as 1.99 USD per rapport. These rapports contain all personal information of the arrested, full details about the arrest itself and even the original mug shot. On the other hand, there are several websites that offer the service to remove this data from their public, online database for prices that range from 59.99 USD (removal within 4 hours) to 39.99 USD (removal within 24 hours) per rapport. Getting much data is cheap, getting little data removed is expensive. This project started with me getting access to Yahoo_disclosure.txt: a file with thousands of leaked Yahoo e-mail addresses and passwords. Within this huge amount of data, I found several e-mail addresses that had phrases like 'help me' and 'save me' integrated in their passwords. These people had chosen to lock their accounts with a cry for help. 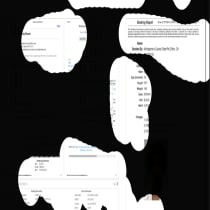 Of all these e-mail addresses, only one revealed an actual name (instead of a nickname or merely initials); its password was SAVEME123.When searching for the name that belonged with the password, it quickly became clear that this person had been in trouble with the law several times recently. So the Yahoo_disclosure file had not just exposed a password providing access to an e-mail account. Inherent to this it exposed even more private information, being the troubled state of mind of the user and also all the sensitive information published trough several police records. For a mere 9.95 USD I bought all five booking reports of this person, containing the full name, physical characteristics, the original mug shots and all the specifications of the arrests (location, charges, bail sum, the full name of the officer that did the arrest, etc). I could simply pay with PayPal and then got the PDF file e-mailed within the second. After this transaction, I was also offered the option to permanently remove the information I just purchased, for 59.99 USD a file. So, now I'm making you the same offer. For donating 1.99 USD, you will get a publication containing the information of one booking report. When the goal of 59.99 USD is reached, it will be used to remove one booking report. You can also donate 3.98 (for 2 publications), 5.97 (for 3 publications), 7.96 (for 4 publications) or 9.95 (for 5 publications).